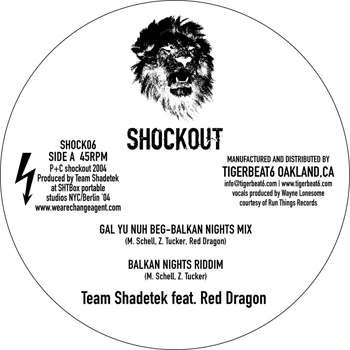 Sitting alongside this week's immense Shadetek sponsored "Heavy Meckle' comp, this new Shockout joint finds two of New York's hottest crews, Team Shadetek and Drop The Lime, join true dancehall classic Red Dragon (aka Kingston-born Leroy May, one of Jamaica's most consistently popular DJs who has worked with King Tubby, King Jammy's, Steely And Clevie, Bobby Digital, Danny Browne, Winston Riley, Fashion Records, VP, and Sly and Robbie's Taxi label). soze.sht and Zach Zizmore propel their Balkan Nights riddim, crisply cut guitars, and jump-and-shake hand claps with deep digital bass. With one foot in new dancehall and R&B, the other in outernational digital space, Drop The Lime keep the beats raw but steady; broken dancehall rhythms swarm in all directions, catching an organized structure by the swollen bass and pinsharp vocal delivery of Red Dragon's sexually provocative toasting. Dope.